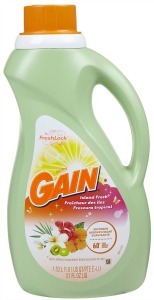 Pam has shared her Gain fabric softener review, of the original scent, with me. P&G has changed the scent of the Gain Original Fabric softener...It's disgusting. Smells like kids candy or something offensive. None of us like it and have started trying new brands. I called P&G and they said they haven't changed a thing and NO ONE has complained. This is simply not true and they are losing customers because of the new smell. Thanks so much for sharing your review of this product Pam. I know many readers have complained about the change in scent of Gain detergent itself, which has Freshlock, but this is the first I heard about this "Freshlock" change also making the scent of the liquid fabric softener different as well, although I would guess it would, come to think about it. I'd love to hear from even more readers who use any of the scents of Gain fabric softener sharing their opinions and experiences with it. You can share your review here, or read other reviews that have already been submitted, including for the dryer sheets and scent booster products. Here's another review of a different scent of Gain softener, from an SR101 reader. I used to absolutely love this scent before they changed to the Freshlock. I knew there was a difference, and still had an older bottle of it left without the freshlock, and you can definately tell a difference. The one with the freshlock smells like bubble gum. I won't use it anymore. Why did you change it? Especially now that you have seen how so many users are displeased, and have stopped using it? Almost turns me away from Proctor & Gamble period! I would resume buying this product again if you go back. Is it cheaper for you to make it like this or something Disgusting!!!! Thanks for providing your review of this product. As you can see from the review above you're definitely not the first person to conclude the addition of "freshlock" ruined the smell of many Gain products. There is also another page on the site discussing how freshlock also changed, for the worse, the scent of Gain's detergents as well. Please note that I am not in any way associated with Gain or Procter & Gamble, so I cannot answer why they've decided to change the formula. If you're looking for a new fabric softener, I would suggest reading fabric softener reviews from readers here (scroll down the page to after the information on how to use it) to see if you can find something others have enjoyed. Good luck, and hope the reviews from other readers help you out. I use the Gain original liquid fabric softener and the Gain original fabric sheets and they work great together. I get the great smell I want and I don't have to buy the expensive Gain washing detergent with it. 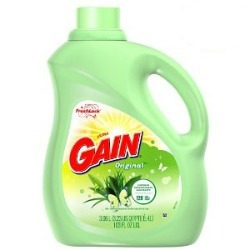 Instead I buy an off brand detergent, because I use the Gain fabric softener my clothes smell Gain fresh. The smell of Gain Detergent and Gain Softener is so strong it irritates my nose and makes me nauseated.